Apple, Google and Microsoft are sitting on a mountain of cash -- and most of it is stashed far away from the taxman. Those three tech behemoths held a total of $464 billion in cash at the end of last year, according to a Moody's report published Wednesday. Apple (AAPL) alone had a stunning quarter-trillion dollars of cash thanks to years of gigantic profits and few major acquisitions. That's enough money to buy Netflix (NFLX) three times. It's also more cash than what's sitting on the balance sheet of every major industry except tech and health care. All told, non-financial U.S. companies studied by Moody's hoarded $1.84 trillion of cash at the end of last year. That's up 11% from 2015 and nearly two and a half times the 2008 level. Roughly $1.3 trillion -- 70% of the total -- is being held overseas, where the money isn't subject to U.S. taxes. 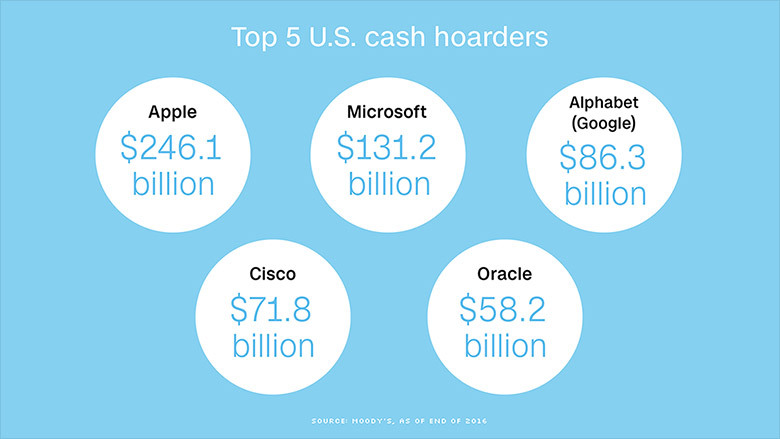 Apple, Google owner Alphabet (GOOGL), Microsoft (MSFT), Cisco (CSCO) and Oracle (ORCL) hold 88% of their cash overseas. Moody's said the tower of money stashed abroad reflects the "negative tax consequences of permanently repatriating money to the U.S."
The Trump administration has proposed a one-time tax holiday to encourage companies to bring that cash home. Treasury Secretary Steven Mnuchin said in March that the fact Apple has "all this cash" is a symptom of the high U.S. corporate tax rate relative to foreign rates. "Why would they bring cash back onshore and pay huge amounts of money?" Mnuchin said at an Axios event at the time. Related: Should Apple buy Disney? Tesla? The Raiders? That American companies are flush with cash shows how much healthier they've become since the Great Recession. But corporations' reluctance to spend that money is holding the recovery back. Cash sitting on the balance sheet is money that isn't being put to work on job-creating investments like new factories. Despite their swelling coffers, capital spending by U.S. companies plunged by 18% last year to $727 billion, according to Moody's. Much of that decline was because of a downturn in the oil industry, which forced energy companies to preserve cash by delaying investments. Spending on dividends, stock buybacks and even acquisitions also declined last year, Moody's said. Wall Street is hoping Congress will go along with the administration and give companies an incentive to bring their huge sums of overseas cash back to America. Proponents of a tax holiday argue that bringing the money home could unleash the U.S. economy by promoting hiring and investment. Critics say Main Street wouldn't feel the effect because many companies would opt to reward shareholders with dividends and stock buybacks. Of course, tax reform would be extremely complicated given the countless competing interests and the gridlock in Washington. The challenge is only more complicated by this week's collapse of Senate Republicans' plan to repeal and replace Obamacare. Some analysts say a deal between President Trump and Congress on tax reform now appears less likely. "The health care failure increases the level of desperation. 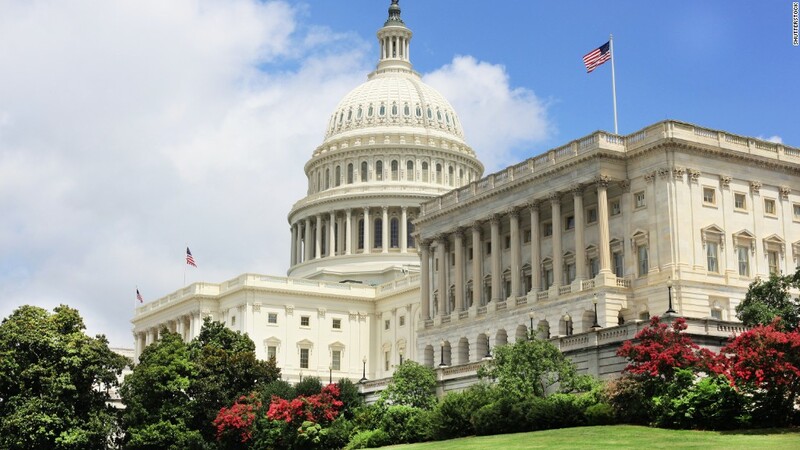 But it makes the process, policy, and politics harder ... of an already really hard issue," Chris Krueger, senior policy analyst at Cowen Washington Research Group, wrote in a report on Wednesday. So the mountain of cash companies like Apple have been hoarding may continue to grow.